A white Thanksgiving is likely for much of the Northeast. 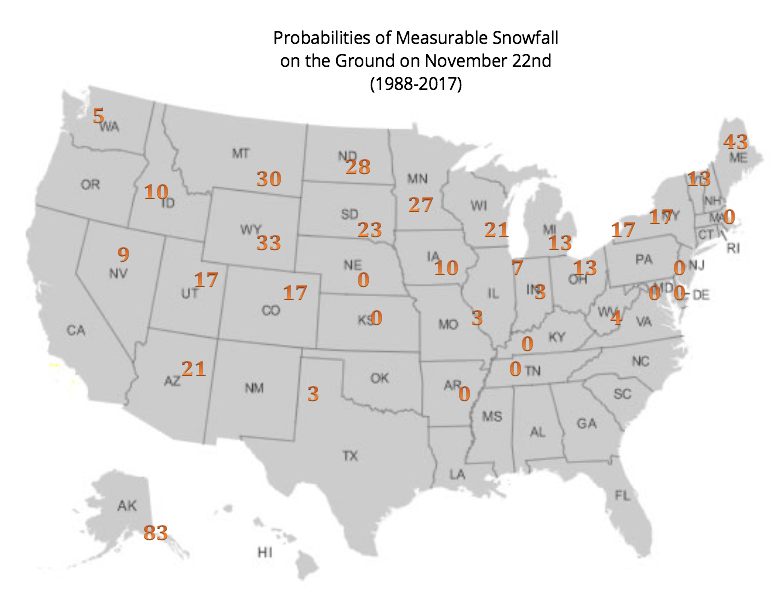 Snowfall probabilities based on 1988-2017. Historical probabilities, based on the last 30 years, show us that Anchorage, AK is the most likely to have a white Thanksgiving with an 83% probability to have snow on the ground. Northeast cities have a 0% (Mid-Atlantic) to 43% (Caribou, ME) chance of a white Thanksgiving. But a look at a snow map and out the window tell us the odds are higher! Late last week an early-winter storm brought measurable snow to most of the Northeast, which has lingered due to colder-than-normal temperatures. Current snow & ice conditions (as of November 20) provided by the NOAA, U.S. National Ice Center. The Northeast is expected to be frigid on Thanksgiving day! Most of the snow currently on the ground will stay for the holiday. High temperature forecast for Thanksgiving Day issued by the National Weather Service.